Variations: You can sprinkle parmesan cheese or cajun spice over the roasted asparagus. Preheat the oven to 400ºF (205ºC). Position an oven rack to the center position. Rinse the asparagus and pat dry with a cloth. 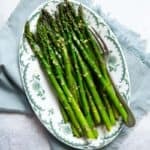 Snap off the ends of the asparagus. Transfer the asparagus to a large baking sheet. Drizzle the olive oil over the asparagus. Rub and roll the spears around so that they are covered in oil. Spread the spears so that they are lined up in a single layer. Sprinkle a pinch of salt and black pepper over the asparagus. Roast the asparagus for 8 to 9 minutes. If the asparagus are pencil thin, roast them for 6 to 7 minutes. For the chunky asparagus that are about 1 inch thick on the bottom, roast them for 10 to 12 minutes. Take the asparagus out oven and sprinkle the lemon zest on top. Use a spatula to gently toss the asparagus with the lemon zest. Serve immediately.